We started shearing the adult ewes and rams on Monday early in the morning. Two shearers arrived - Kevin Ford who shears with blades - and Gwen Hinman who shears with electric clippers. It was a long day and very hot and humid. 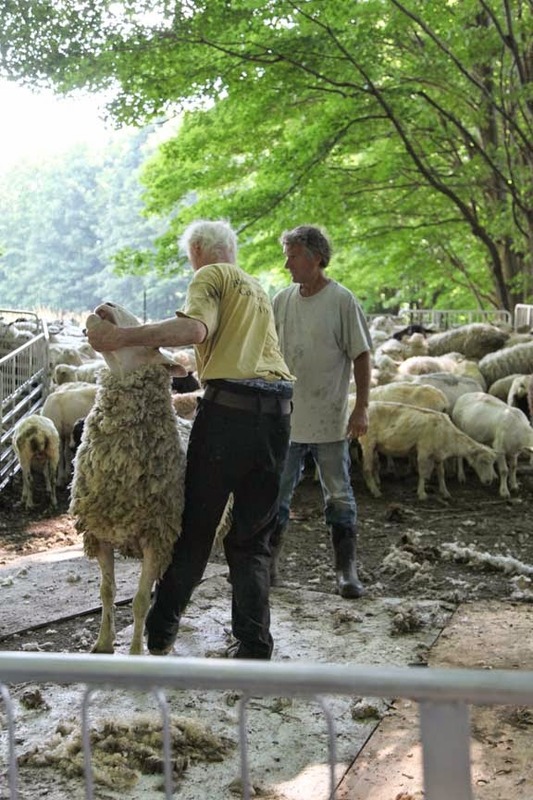 The Farmer catches a sheep and feeds it to one of the shearers. 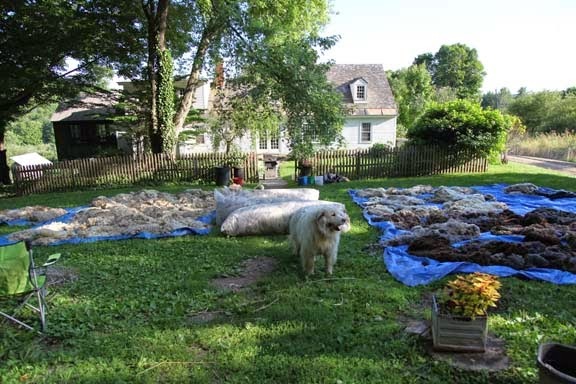 I am outside the corral, skirting the wool and bagging it up into enormous wool bags that hold 250 pounds of wool. 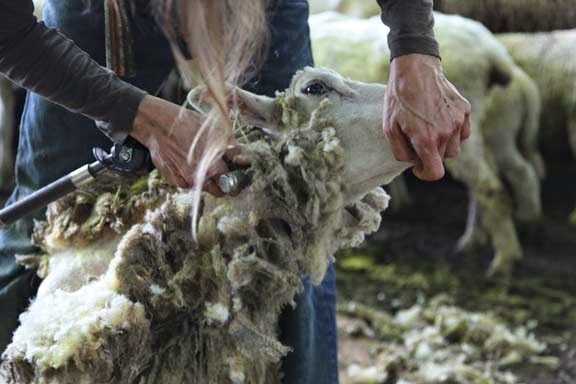 Here are some photos of Gwen shearing. She is so lean and strong and watching her makes me think of a ballet as she moves the sheep around under her shears. She cleans the sheep of wool in about 3 to 4 minutes. Here are some photos of Kevin working his blades. Gwen shears twice as many sheep as Kevin and they are paid by the animal. Kevin is very zen about things and prefers the silence and skill of blade shearing. He is a most amazing guy and a really interesting person to be around. 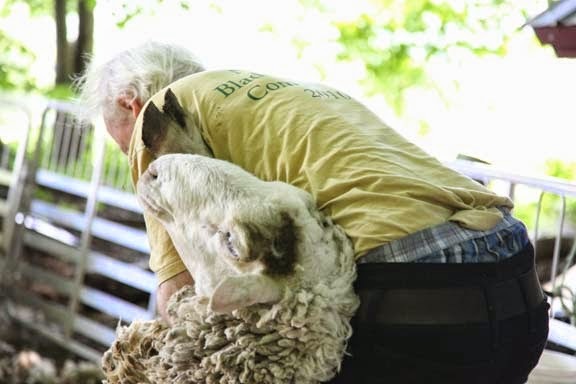 He was in Ireland earlier this year competing with his blades in the World Competition of Sheep Shearing. 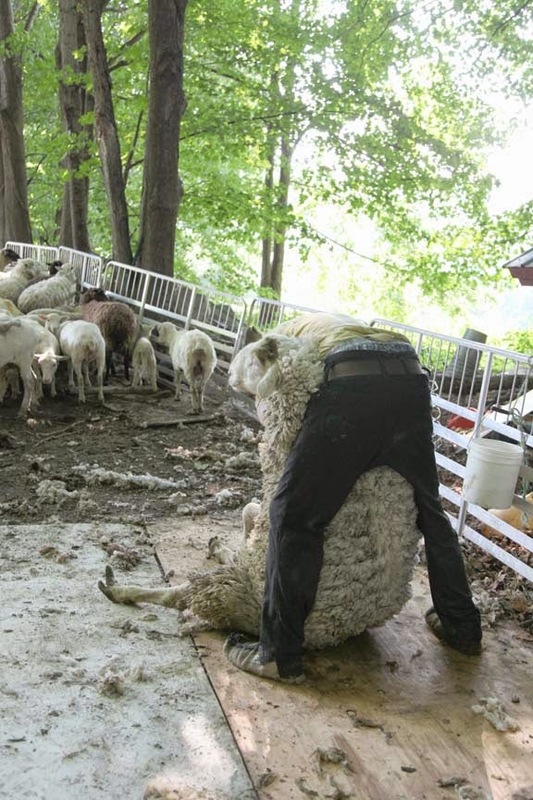 These photos show him shearing our 300 pound Polypay ram. Mid-afternoon Monday, after a nice lunch (the shearers always appreciate a nice lunch), we were down to 27 sheep to go and the heavens opened up and there was a monsoon. Shearing had to stop. You can not shear wet sheep. We covered up the enormous wool bags with a tarp and hoped it would stop. It didn't and we quit for the day. We scheduled another day with Gwen and then hoped for good weather. 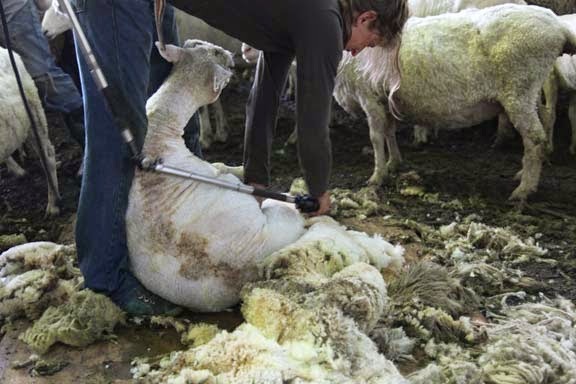 So now we shear there. The Farmer brings the sheep in and sets up the portable corral. 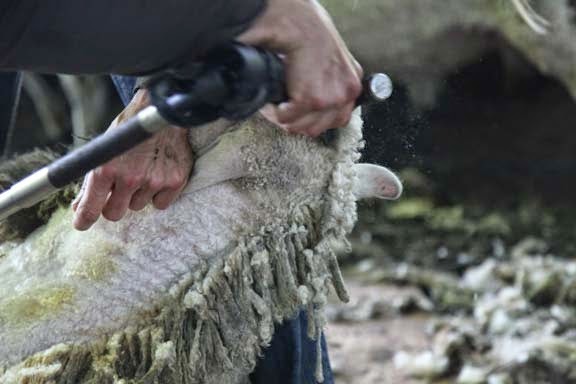 The sheep can't be wet when shorn or the wool will become moldy and full of mildew. It is one giant logistical nightmare and nothing either The Farmer looks forward to or me either. The realities of building a shearing shed are not financially feasible - $25,000 to use once a year makes no fiscal sense. At lunch, one of the shearers told us about a big sheep farm building a $4.3 million dollar barn. I'm thinking probably more money than sense. How will they ever recoup that cost? Here is what our lawn looks like tonight. Some of the wool that had been stored in the giant wool bags soaked up some water during the monsoon - even though it was undercover. We have it spread out on tarps to dry because there is a good stretch of weather. We'll re-bag it and then get it under cover until the buyer picks it up. I'll be happy when we get the check. Winston has now taken it upon himself to guard the wool. Cute boy. I always get asked what we do with all the wool. My standard answer is get it out of here - hopefully dry - and try to get enough to cover the cost of the shearing. When you have this much raw dirty stinky wool, you just want it out of your life quickly. If we had untold amounts of money, I might go into getting it custom spun and market it. But I know how much work that is - remember I used to work for a yarn company - and I know what the financial return is on it. I just don't have the energy or the interest. When we had four sheep it was easy to get all romantic on how gorgeous the fleece was and then spin it myself to knit The Farmer a sweater - which I did do a few times back when we were beginning raising sheep. I'm just past that now. And I am totally okay with it. 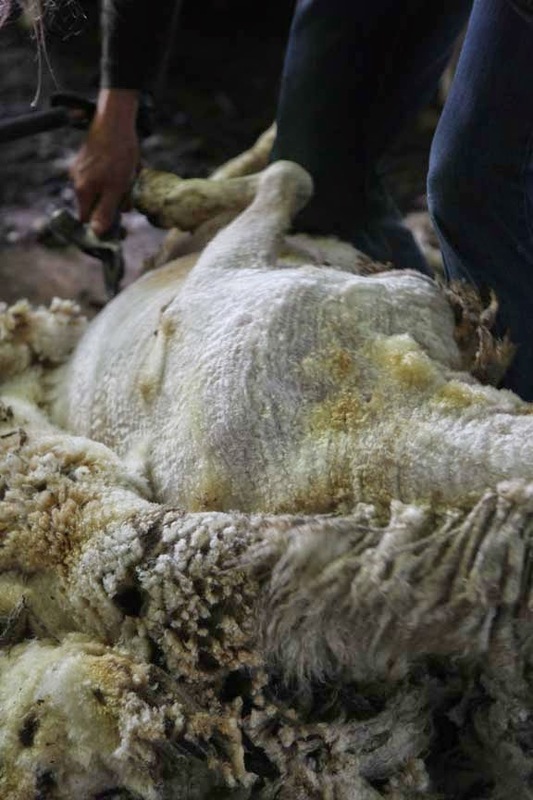 I suppose seeing these photos makes you appreciate where your wool does come from! Often, when "People" consider buying my knitted and crocheted stuff, "comment" on the Prices, I have to remind Them that They're pretty much paying for the YARN rather than my actual "work", otherwise that $25. Toque would be costing $80.! And that raising sheep ain't cheap, nor is the price to convince Them to get "NAKED" so WE can stay warm! BTW, I was wondering, would one of those LEAF-BAGGING contraptions work on picking up the "FLUFF", or are those bits too heavy? Happy to see Winston. Haven't seen him since the winter and wondered how he fared during the cold weather you had. What a great post! It's so educational following your sheep farm! Thank you for sharing! It does! Make me appreciate where my wool comes from I mean. 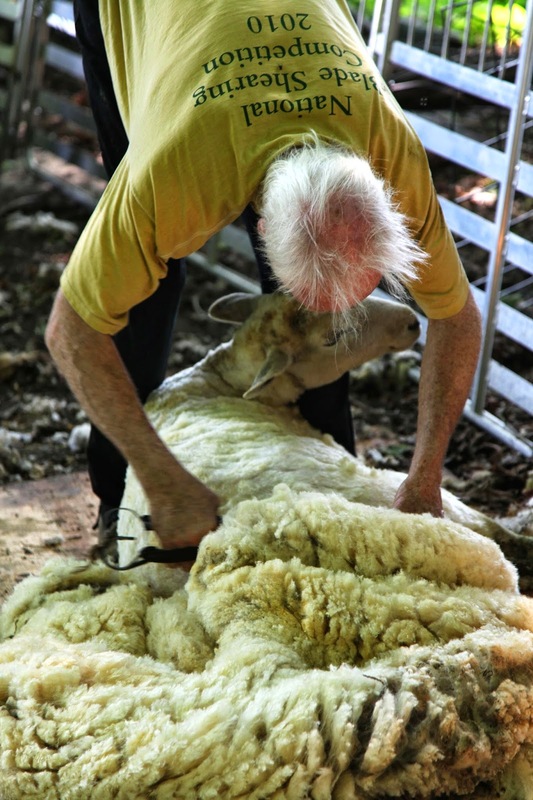 Love the shearing with the blades photos. Thank you so much, Kristin, for this detailed post, words and photographs. 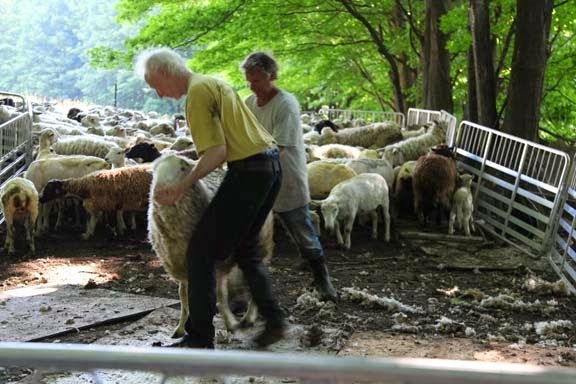 I've previously seen documentary films about sheep shearing, and so I did know a bit about what's involved. However, your up close report and reflections about the entire process really have added to my understanding and admiration for sheep farming and farmers. 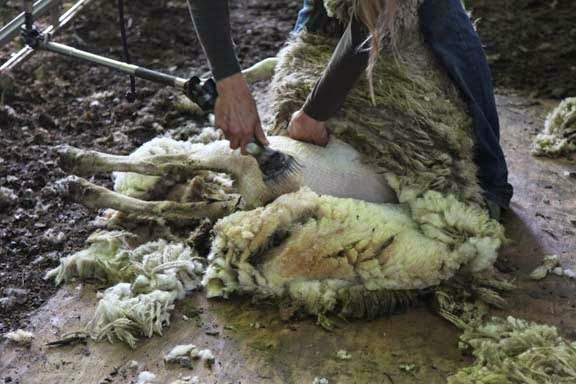 Having sheep, I so understand what a crap shoot shearing can be. At least my flock was never large enough (40 ewes and their lambs at the peak) to not fit under the shed roof. Kevin is very dependable and arrives when he says he will but I know that some shepherds have to factor in the possibility that the shearer won't show up! I remember the huge bales of fleece waiting to be picked up on the farm. That's over 30 years ago and it wasn't worth anything - I remember how my farmer used to grumble about the shockingly low price for it. 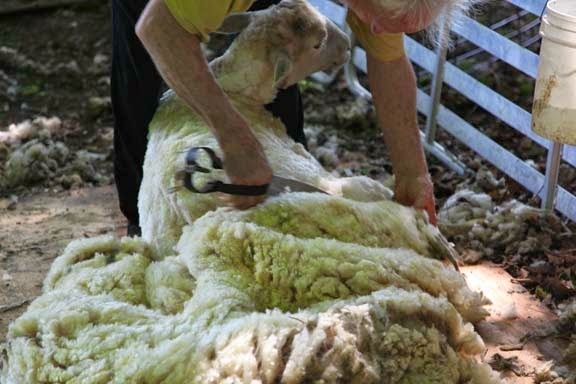 Great to see Gwen and the old-school shearer. I don't recall seeing a woman shearing - she sure does look as though it keeps her fit. Great post Kristin - hope the sun's shining for you. Great post! I've watched shearers in action up here and I have never seen someone work harder or more humanely. Some wool up here is bought to be scoured and turned into mattresses at a local mill. The waste is felted and bought by local needleworkers. That warmed my wooly little heart! I definitely appreciate where wool comes from. More so thanks to the education I get from you and the Farmer. 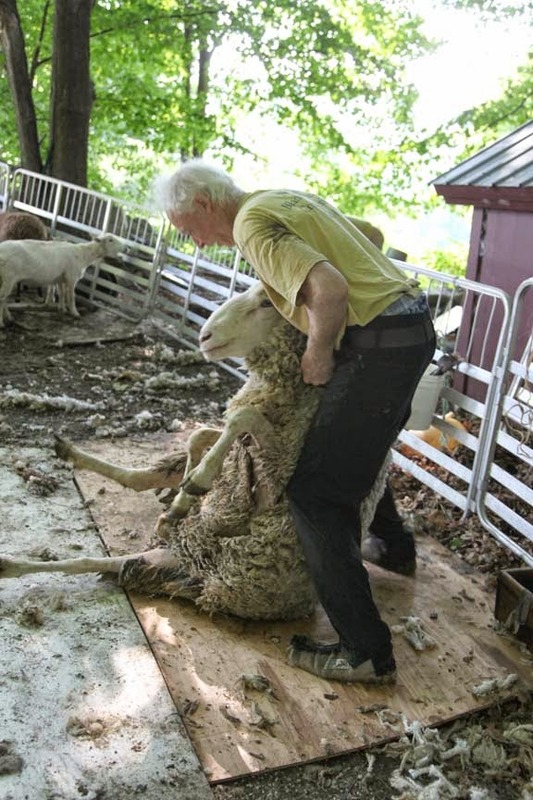 Love the photos and your story . . . . especially the ram getting sheared. What a huge head. And he looks so forbearing of it all. Well, maybe not so much in reality! thanks again for all you guys to for us yarnaholics. I always appreciate reading about the farm life. I'll never have the space to care for sheep of my own, so I have to live vicariously through you ;D.
So..city girl here..it appears the sheep,is sheared so the wool stays in one piece, is that correct? If so, what is the reason. Thanks.